Any growing media needs to enable the constant inflow of water, nutrients and oxygen to the plant’s roots. Substrates must anchor the plant and have certain characteristics that will promote the growth and development of plants; and they must have suitable air and water capacity. In gardening, substrate usually denotes a mixture of different substances of organic and inorganic origin. In certain cases, soil-based substrates are enriched with soil supplements. Soil supplements are products that are added to the soil for the purpose of maintaining, improving or protecting the physical or chemical properties of the soil, as well as the structure and/or biological activity of soil. They can help retain moisture, reduce compaction and aerate the soil to allow water and nutrients to more easily move through it and reach plant roots. An interesting article by Kazemi and Mohorko (2017) provides an overview of different studies on growing media used in green roof system applications in different climate zones. They mention several soil supplements that are or have been used on green roofs. 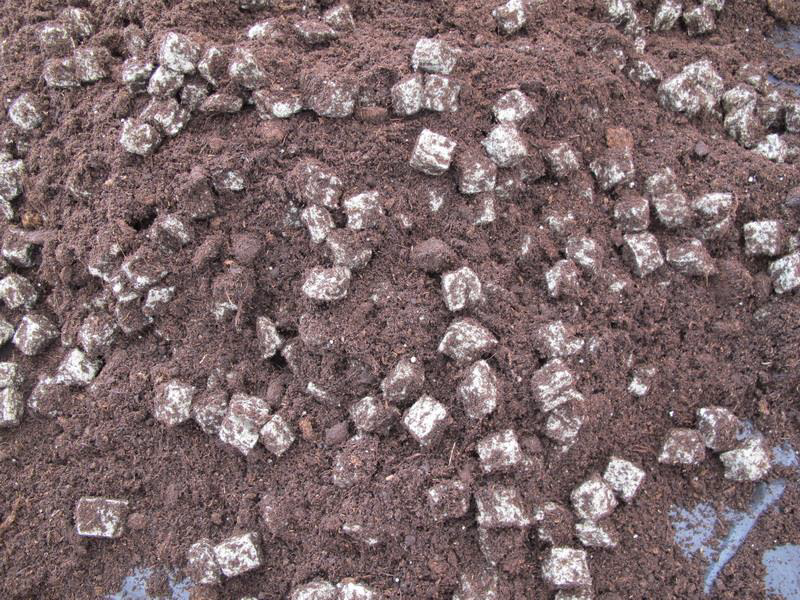 Peat was recognized as unsuitable due to its rapid decomposition; therefore, more stable organic matter should be added. 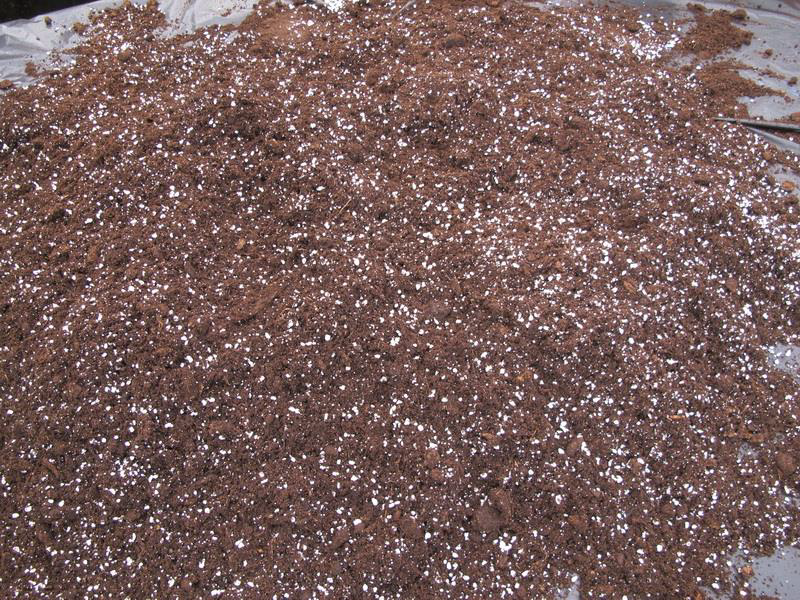 Other supplements, such as perlite, showed mixed results, depending on the plant type and climate zone of the given project. 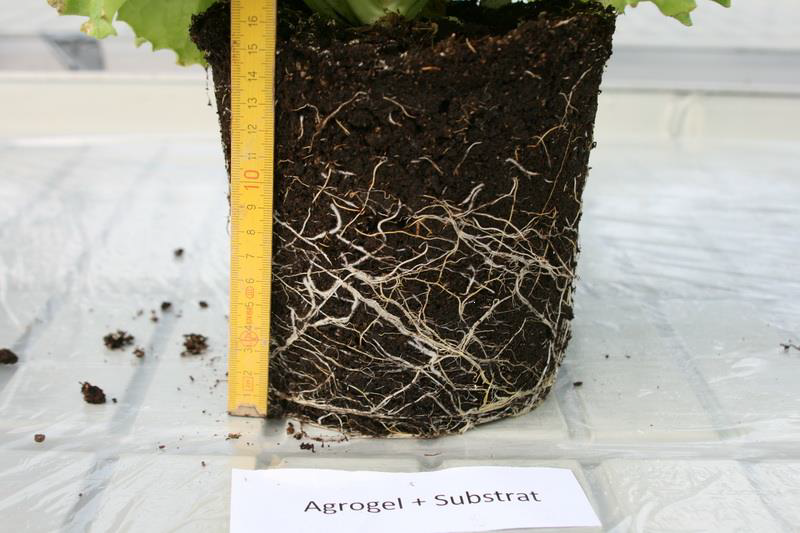 Water retention of hydrogel-based growing media showed a significant drop in water retention after fertilization; another superabsorbent polymer (urea-formaldehyde resin foam) exhibited the problems with salt accumulation. Perlite has been found as suitable in certain cases, but is prone to disintegration over time. Apart from green roofing, water saving or water retention of growing medium is an important aspect in any production of vegetation. From this perspective, several interventions were investigated. As a base substrate and control substrate, the widely available 14:10:15 substrate with pH 6,3 for professional growers was used. This substrate was mixed with Urbanscape® rock mineral wool (Photo 1) and with other substances such as perlite (Photo 2), vermiculite and superabsorbent polymers. The trial was performed in a greenhouse between the 37th and 47th week in 2016. Water retention capacity was determined gravimetrically by weight, with the results displayed in the chart below. The chart shows the amount of water retained in the pots as determined by the weighing method. The dotted line shows the amount of water (in ml) that was added to the plants through the trial. 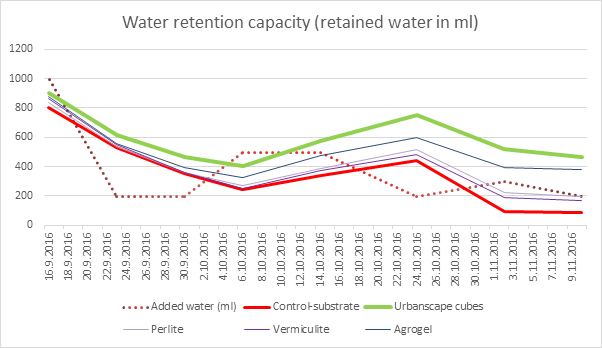 The solid green line shows the amount of water retained in the substrate with added Urbanscape® Green Cubes; the solid red line shows the results for the substrate without any additive; and the rest of the solid lines show the results for substrates enriched with perlite, vermiculite and the superabsorbent polymer (agrogel). Graph 1. Water retention capacity of substrate and substrate with additives. What about the plant roots at the end of the trial? 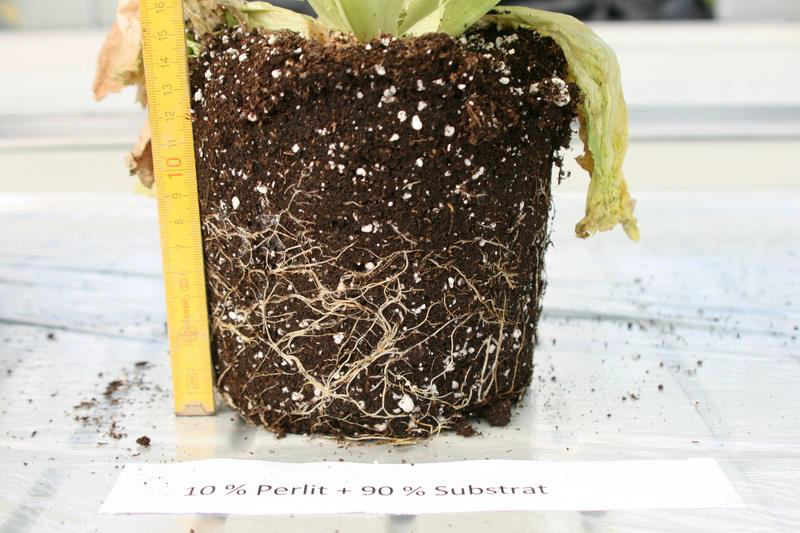 In the continuation, we provide a visual comparison of the plants roots. Photo 3: Roots of Lactuca sativa in substrate, end of trial 2016. Photo 4: Roots of Lactuca sativa in substrate enriched with Urbanscape Green flocks, end of trial 2016. 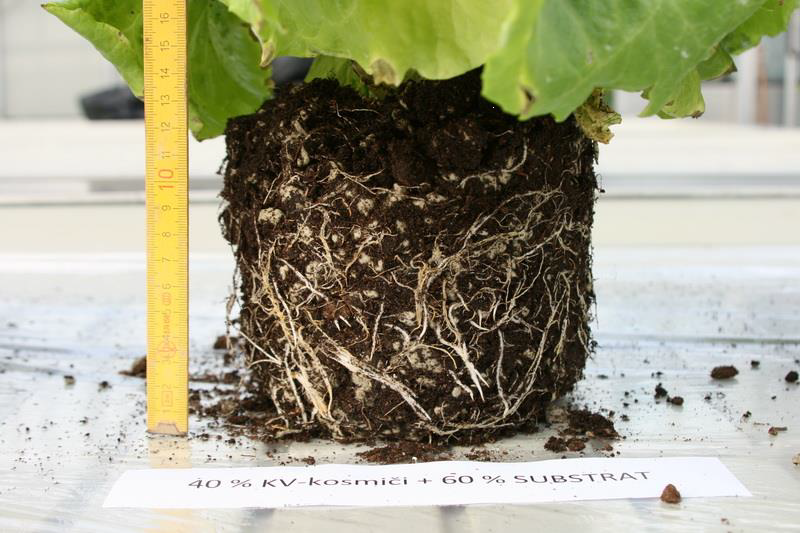 Photo 5: Roots of Lactuca sativa in substrate enriched with perlite, end of trial 2016. Photo 6: Roots of Lactuca sativa in substrate enriched with vermiculite, end of trial 2016. Photo 7: Roots of Lactuca sativa in substrate enriched with agrogel, end of trial 2016. 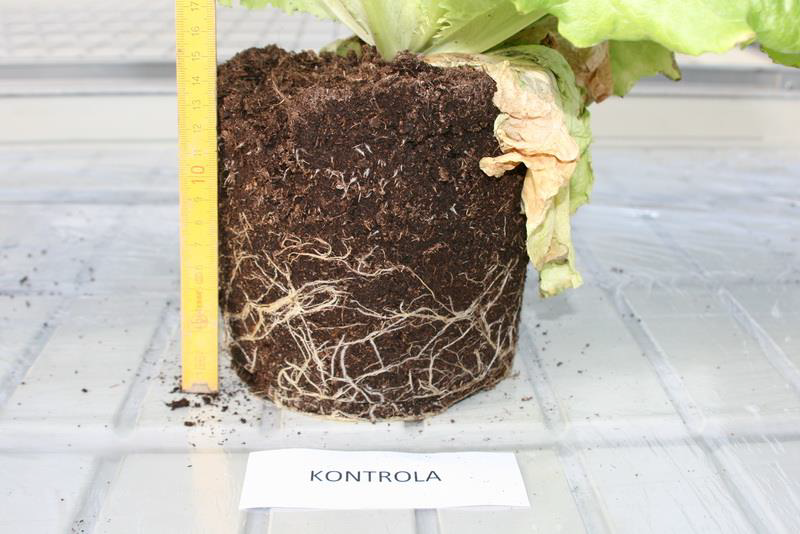 Analysis of the root system of the plant Lactuca sativa in this particular trial showed significant differences between the various growing scenarios. The root system was most uniformly developed and distributed throughout the pot using Urbanscape® Green Cubes and Green Flocks (stronger root system). 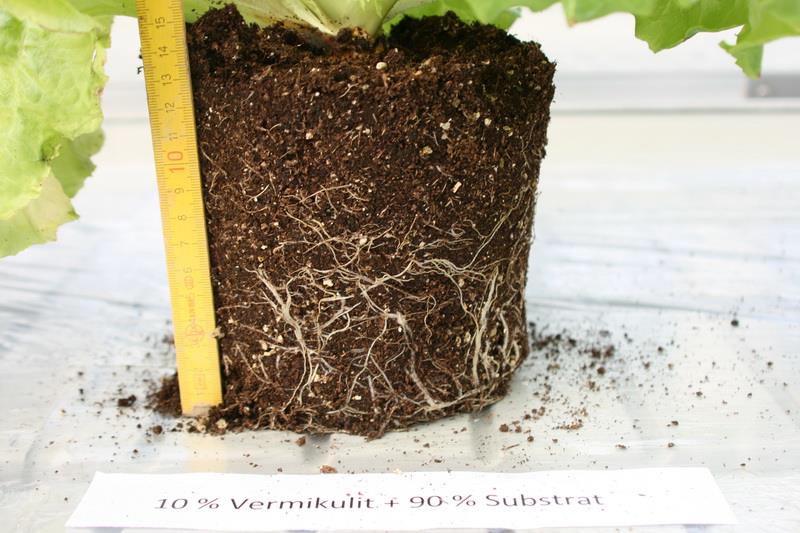 In the remainder of the cases industrial substrates – control, substrate with perlite, vermiculite and agrogel – a majority of the roots were developed only in the bottom half of the pot. Would you like to learn more about Urbanscape® Green Cubes and Green Flocks? Visit our website www.urbanscape-architecture.com contact us via e-mail urbanscape@knaufinsulation.com or download our Landscaping brochure and product data sheets below. Kazemi, F., Mohorko, R., 2017. Review on the roles and effects of growing media on plant performance on green roofs in world climates. Urban Forestry & Urban Greening 23: 13–26. KI Internal report, 2017. Influence of different soil supplements on water retention and yield of Lactuca sativa L..[?] University of Maribor, Faculty of Agriculture and Life Sciences, p 29.